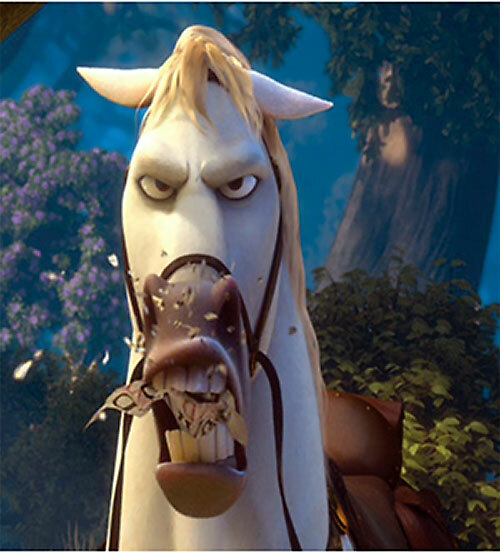 As to Maximus… he is not your average horse. Base Of Operations: Royal Palace. Height (at shoulder): 16 hh (5’4”). Weight: 1,000 lbs (05 APs). 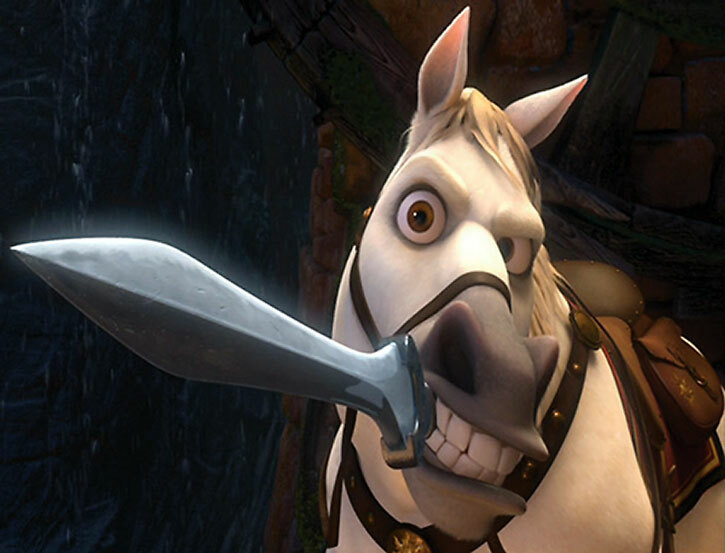 Maximus is a horse in his prime, a warhorse! He is slightly larger than the other horses in the Royal guard and his rider is the Captain of the Guard. Like his rider he demands the respect of those who follow him, be it horse or human. One thing that makes Maximus unique, or should I say one more thing that makes Maximus unique is his ability to track like a blood hound. He can also amazingly use his teeth as a paper shredder. Not only can Maximus understand humans but can pass on what he hears to other horses in a manner they can understand. Maximus is the Head Horse of the Royal Palace Guard. 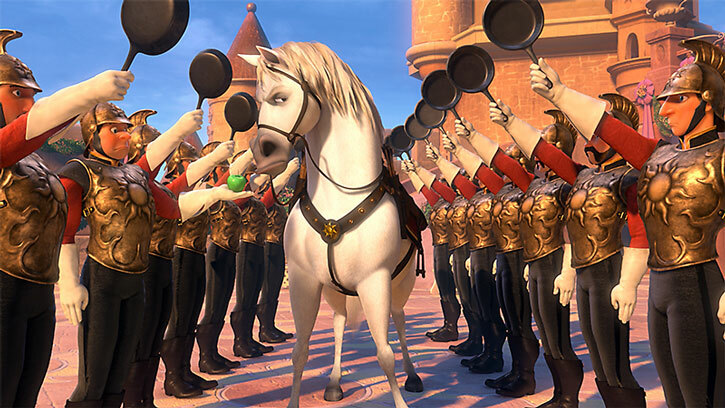 After the Lost Princess’ Tiara was stolen by some no good thieves, Maximus went into action. He and his rider chased the bandits through the woods. 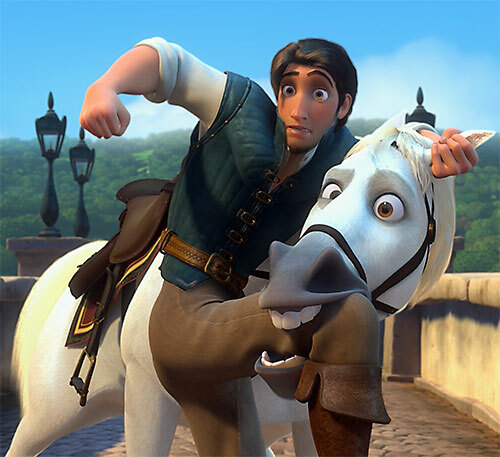 Two were captured but one, Flynn Rider, evaded capture. Maximus had trouble picking up Flynn’s trail after the fall they took. But he eventually followed him to a tavern, the Snuggly Duckling. There he discovered a hidden passage and was again on the criminal’s trail. Flynn had gained a new companion, Rapunzel. Maximus was intent on capturing them both. He led his human companions to the ledge of a cliff where Flynn dispatched all of them in melee combat. Unimpressed Maximus went into the fray, broadsword in his teeth! 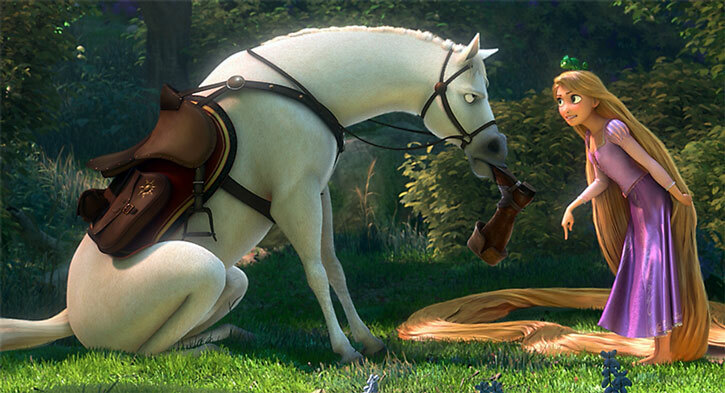 Again, Rapunzel and Flynn found a way to escape him. But this time they were covered in flood waters and most likely drowned. 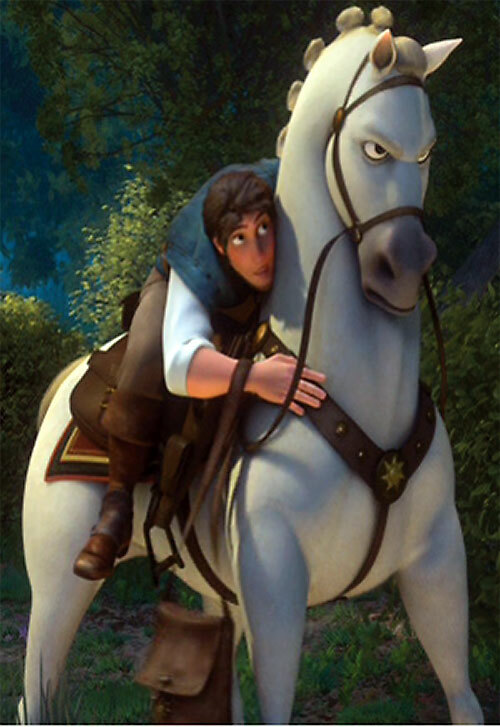 However, Maximus is not the kind of horse to leave it to chance. He would continue his relentless pursuit, catching up to the duo again later. 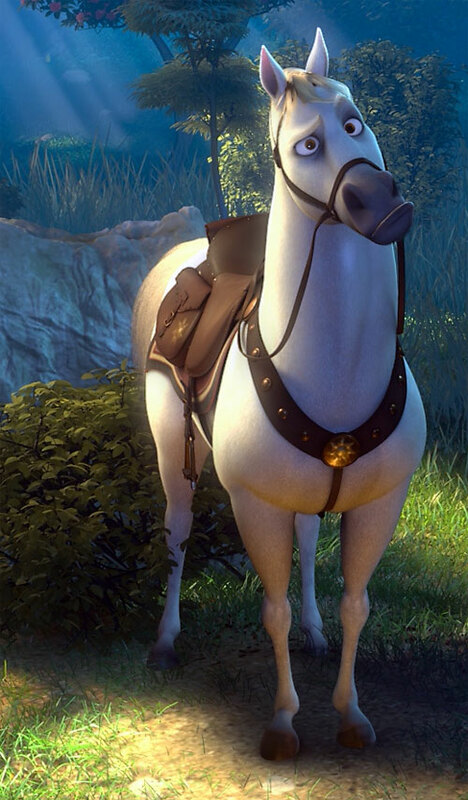 Maximus is a large and strong white stallion. He is dressed in brown and red royal saddle and bridle with the Royal emblem emblazoned on them. His tail and mane are bound up. Maximus is stern, taking his job seriously as head horse. 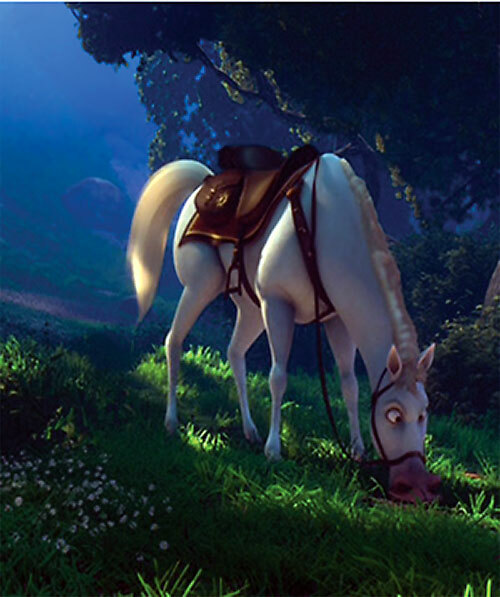 When Flynn Rider takes the Lost Princess’ crown, Maximus takes it upon himself to track him down alone and unlike his human companions, he never quits. Maximus is one of the good guys and tries very hard to do the right thing. Maximus rarely lets his guard down to let others know any other side to him other than his being a soldier. Speak with Animals only to speak with horses (-1). Credentials (Royal Palace), Languages: Horse, (Maximus understands English but cannot speak it). Minor Irrational Attraction to Responsibility of Power. 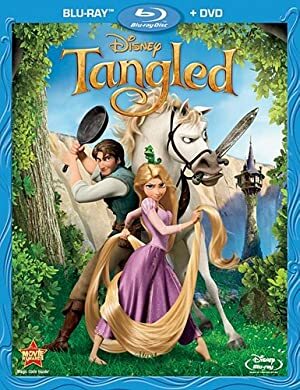 Source of Character: Disney’s 2010 animate film Tangled, character voiced by Frank Welker. Helper(s): Animals File from W.org, Wikipedia, Michael.